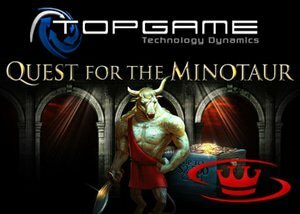 Greek Mythology comes back to life in spectacular fashion from TopGame Technology, looking to escape the awesome and feared titular character through a full story mode. Follow the path of Lady Ariadna through this 20 pay line, 5 reel video slot game with the ultimate goal of finding a way out of a confusing labyrinth and escaping the wrath of the minotaur that inhabits it. Along the way there are various smaller prizes to be collected as well as bonus features sure to keep even the more seasoned players engaged. The game play throughout is seamless, with minimal wait time as different features load and new rounds are set up. Paired with superbly crafted graphics and a well suited music and sound effect score, this game sets the mood for what is sure to be an epic quest and a thrilling story of escape from the maze. Players have the chance to hit the jackpot through the game's Free Spins mode where 12 rolls of the reels are given and a score multiplier of up to 10 times will be applied to whatever winnings happen to come up in this mode. Reaching the exit of the labyrinth also awards players with an additional 2300 credits but be warned, the minotaur is a fierce and ruthless pursuer who will make finding the end difficult. Head to Grand Macao Casino to play Quest for the Minotaur where there are welcome packages get players rolling in style. Touching base with the 24/7 customer support line will give a Cashback offer of up to $500 matched 100% from your first deposit. 300% Deposit Matching, limited at $3000, has been set up exclusively for slot machine players who register a new account and use the code GRANDSLOTS. Get yours today before these fantastic bonuses expire!